It just wouldn’t be New York Fashion Week without a demonstration or two. Filling the quota for the Spring/Summer 2015 season? Argentine designer Victor de Souza, who sent couture-clad models down a “moving runway” of horse-drawn carriages last Wednesday. Animal lovers, however, were having none of it. About 40 protestors from People for the Ethical Treatment of Animals, NYCLASS, and the Coalition to Ban Horse-Drawn Carriages swarmed Central Park South to decry the use of carriage horses, which Mayor Bill de Blasio’s administration seeks to ban. Not everyone shared his opinion, however. 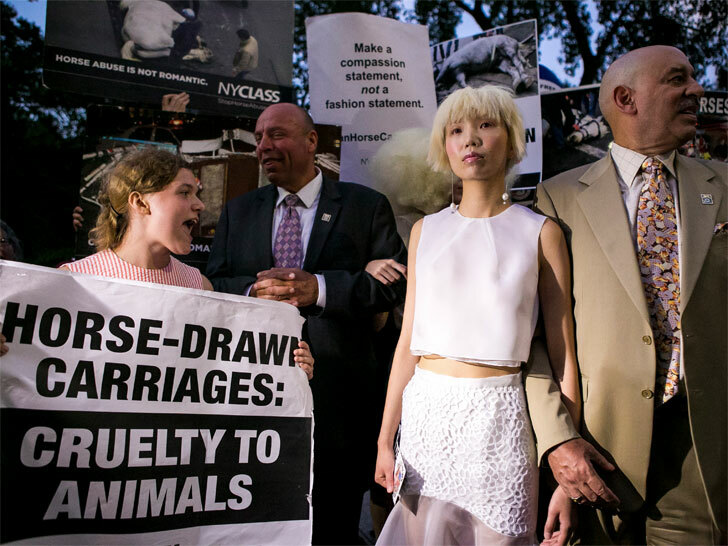 Allie Feldman, executive director of NYCLASS told Metro that De Souza was using “abused animals” for “his own publicity.” “I don’t think a $10,000 designer gown goes well with horse manure,” Feldman added. City Hall declined to comment on the equine “fashion statement,” according to the Epoch Times. May I make a correction to this statement in the article? These people are NOT ANIMAL LOVERS. PETA kills well over 80% of the animals it "rescues". NYCLASS was fined $26,000. (How many animals could that have actually helped?) for ILLEGAL campaign contributions to the deBlasio mayoral campaign. The Coalition spreads half truths and outright lies about the carriage industry. These people are bullies. Stand up to these bullies. Denounce their tactics and their lack of conscience. It just wouldn't be New York Fashion Week without a demonstration or two. Filling the quota for the Spring/Summer 2015 season? Argentine designer Victor de Souza, who sent couture-clad models down a "moving runway" of horse-drawn carriages last Wednesday. Animal lovers, however, were having none of it. About 40 protestors from People for the Ethical Treatment of Animals, NYCLASS, and the Coalition to Ban Horse-Drawn Carriages swarmed Central Park South to decry the use of carriage horses, which Mayor Bill de Blasio's administration seeks to ban.